A well designed and built patio, deck, or porch can change your backyard into a center of entertainment or a haven for relaxation. They emphasize your home’s distinct style for the entire neighborhood to see. Our knowledgeable staff understands all of the different decking and options available, and will help you select the right material for your needs. If you’re looking to expand your outdoor living space with a deck, patio, or screened porch, turn to the experts at Atlanta Home Makeover. We pride ourselves on providing unparalleled satisfaction and the highest level of technical skills and expertise. 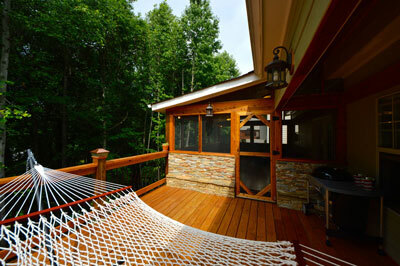 We build decks, patios, screened-in porches, and hardscapes. We can install custom screen rooms to increase the livable space of your home and help you enjoy the outdoors in the comfort of an enclosed space. We can even add a ceiling fan, lights, and other touches needed to make your screened porch feel as inviting as any other room in your house. 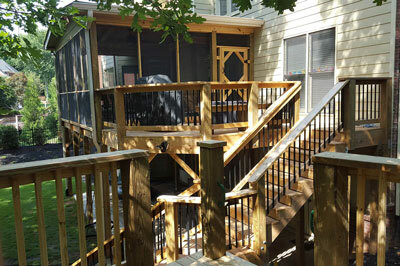 When it comes to deck design and installation, there’s no better place to turn than Atlanta Home Makeover. We use products from trusted manufacturers to ensure that our customers’ decks will hold up for years to come. Like our decking materials, our durable, crack-resistant patio pavers are also designed to hold up long into the future, with almost no need for maintenance. From creating beautiful and functional deck and porch designs through to quality construction and on-time, on-budget completion, Atlanta Home Makeover is here to help in every way possible. Our goal is always to help you realize your dream of a highly livable outdoor space while ensuring that the project remains affordable for your budget. Contact us today to schedule a consultation meeting with our design and construction experts.